Narain Sewa Sansthan (an NGO) in partnership with Indian Dental Association (Both India), jointly organized a campaign titled ‘Tobacco Free India’, during which three doctors including Dr. Sachin Sinha, Dr. J. Peter and Dr. Durga (Dr. Peter and Dr. Durga interchanging each other’s place) travelled around 13 states and covered more than 9000kms in 32 days in a car (without backup vehicle). The doctors spread the message of harms caused by tobacco to all the age groups through documentary movie and presentations. 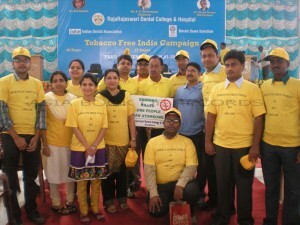 The campaign started at Aluva, Kerala, India on January 24, 2012 and ended at Indian Dental Association (Head Office) in Mumbai, India, on February 25, 2012. Comments for LONGEST ANTI-TOBACCO CAMPAIGN are now closed.